Catch up with #2 here. This was a Saturday, after falling asleep in seconds the night before from being so exhausted, we woke up at around 8am feeling funky, fresh and ready for another exciting day in New York. After both getting ready it was around 10:30am and we decided to set off to somewhere we both had high on our list of places to see, central park. We made sure we wrapped up extra warm as we had been so so cold the day before and started towards Times Square as we knew eventually if we followed that road we would end up at the park. Once we arrived at Times Square we thought it was the perfect opportunity to get a quick bite to eat to fill us up for the rest of the morning and most of the afternoon (you will get to learn quickly that our eating habits on this trip weren't great) and even though it was early we headed for that golden M, hello chicken nuggets. Chicken, fries and 20 sachets of mayo later we headed in the direction of the park. Even walking through the streets of New York is exciting you are always noticing something different and the feel and pace of everything is always so quick and vibrant. When we approached the park it was obvious that we were tourists so... queue the tour guides. Every 2 seconds we were approached by someone who wanted to sell us a "fantastic, unique CHEAP" tour of the park in one of those little bike/carriage things... I forget what they are called! We actually decided against this and set off on foot alone into Central Park. Now... Central Park is BIG and I mean huge. It is 840.01 acres and it feels ten times bigger than that! After walking for about 45mintues we had seen so many places we recognised from TV/Films and it was all so fancinsating and beautiful BUT we had come to one resounding conclusion, we were lost. Seriously lost. There are lots of people in Central Park BUT nine times out of ten they are either running or tourists aswell and as we couldn't bring ourselves to ask someone who was running (way too awkward) we carried on walking hoping to find someone who looked helpful. We had decided that we wanted to go to the zoo and we'd seen a few maps around the park but we didn't seem to be getting any closer to it! Eventually we found a police officer who kindly gave us our own personal map and told us that actually we had already gone past the zoo (of course). 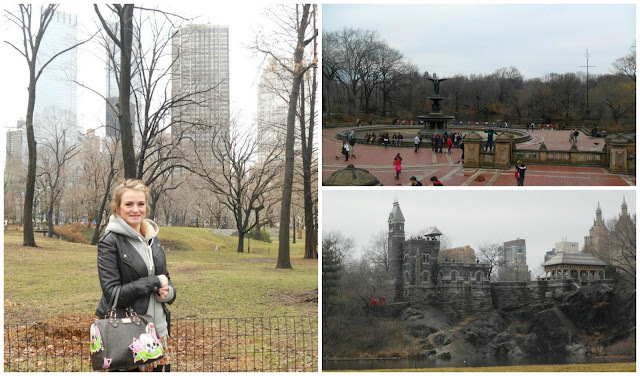 So we decided that the best thing to do was to head back to the main road and walk down the side of Central Park on the street until we found the zoo and thank god - it worked. 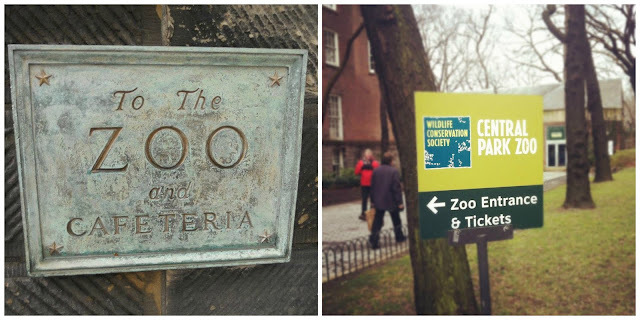 A short walk later and we were there, Central Park Zoo. We went straight in, got our tickets and had our cameras at the ready. First place we went to was the seal enclousre, which is actually a really pleaseant open area! We stayed here for so long becuase they were just so entertaining, jumping out of the water, coming right up and out of the sides, climbing around - they were definitely putting on a show. We had a favourite who had one eye, he/she was hilarious and we took so many photos! 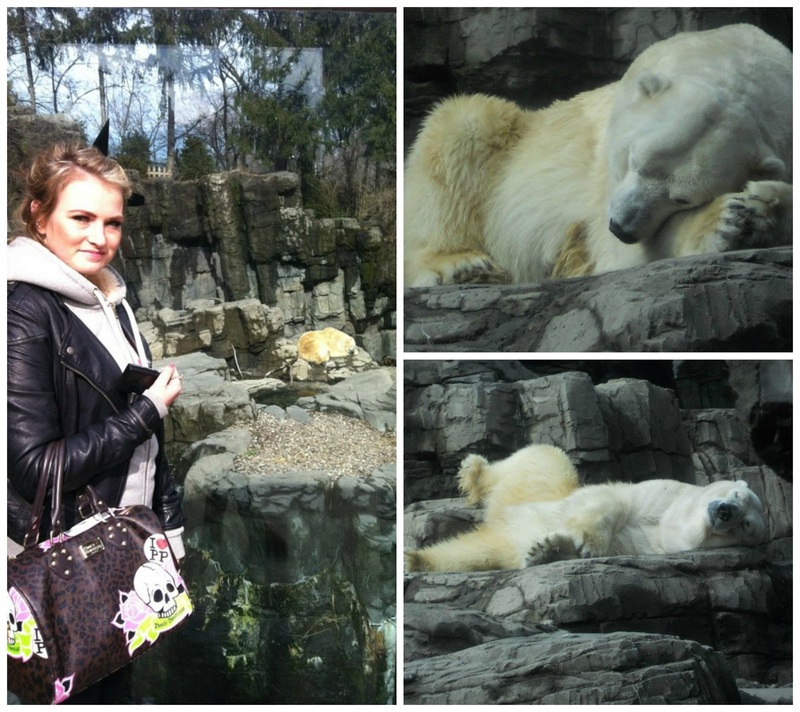 We then headed over to the polar bear and wow. Such a beautiful animal and even though she (I think it was a she) was just sleeping and relaxing you could watch her for hours! There were a few view points and there is one down a flight of stairs which gets you level with the water that is in the enclousure which gave us an amazing view (hence the photos). If you were ever to go there when they are in the water I bet it is incredible. Now central park zoo isn't like it looks in the movie Madagascar and it isn't actually that large, so after checking out the rest of the pens and enclosures (I loved the penguins) we thought it was a good time to head out back into the city and check out some of the shops we had wanted to see. If the Zoo is on your list of things to do I would still definitely go just don't base a large portion of your day around it. 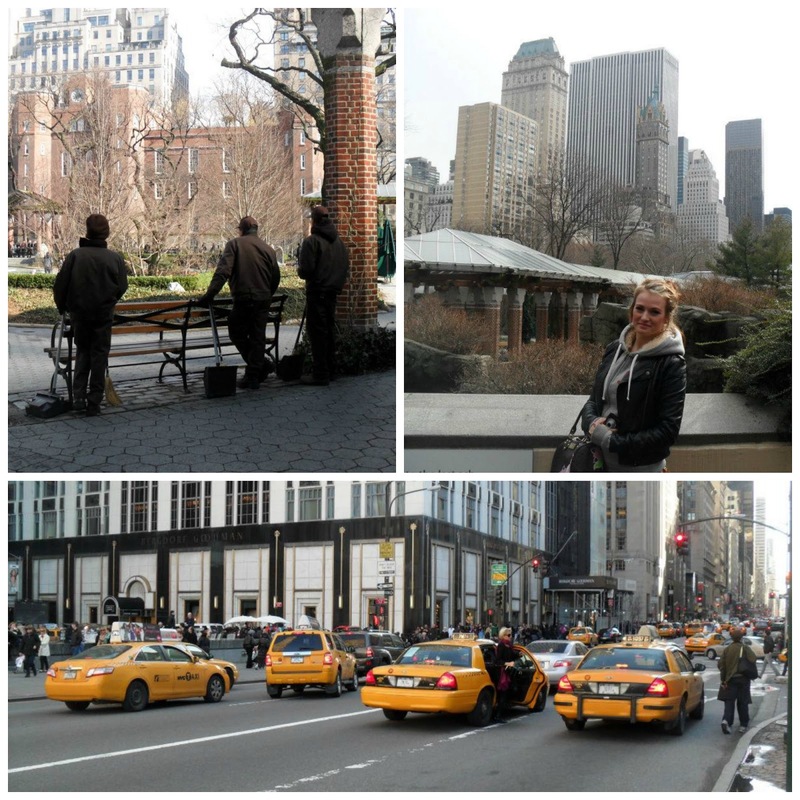 Not far from Central Park we found fifth avenue and along with that FAO schwarz. This huge toy store is known for it's 'big piano' and with it being up there with my 'things to see in New York' we headed on in. Well I am a huge big kid anyway so this store was just a playground - so much fun and some truly awesome things such as wizard of oz and harry potter barbies and huge lego statues. When we got to the big piano it was of course full of children and I didn't really fancy queuing up with them all and looking like a crazy woman so I just got a few photos. After this we headed outside and spotted the amazing building which is the Apple store. If you haven't seen it before it is a huge clear cube on the street and the store is actually underground. You go into the cube and either take the stairs or a lift to the store below. Now obviously we weren't going to be buying anything from apple (we were on a budget here people and where am I going to pack a mac?) but we had a quick look around anyway - we couldn't not. Now it was time for a bit of girly time and after popping into the Ugg store (my feet we freezing in Converse and I was seriously considering buying some) we walked over to the world famous Bloomingdales. Our mission for this store was to find the iconic 'brown bag' and after going to probably every floor we found them. I got the 'little brown cosmetic bag' and my friend got the 'little brown bag'. Bloomingdales is fab to look around BUT I'm really not a fan of people trying to sell me things, I know they are on commission but people that come up and start smearing things all over your hands and basically saying you have to buy the product - no. just no. A few little stores later and we decided that we wanted to head back to Times Square and check out a few of the stores we had seen there. We knew we were quite a walk away and were starting to get a little tired so we hailed a taxi and were there in minutes. We went to Sephora and Mac and both had a little shopping spree. 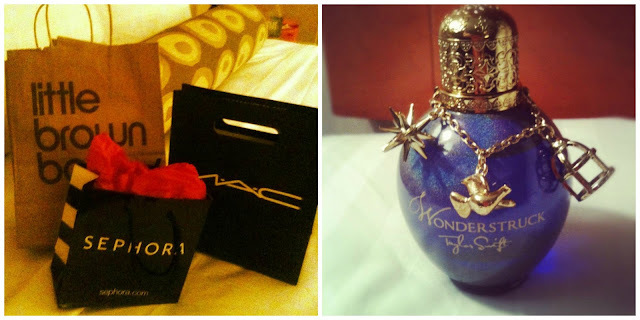 The main thing I wanted to get at the time was Taylor Swift's perfume Wonderstruck as it wasn't available in the UK yet. So I headed straight for perfume section in Sephora and found it and then we both got the Viva Glam Nicki lipstick from Mac which at the time was brand new so we found that very exciting. We walked back to out hotel,which like I said before is about a 15/20minute walk straight down from Times Square, grabbed a slice of pizza for dinner and went and had an early night because we knew that Sunday morning was going to be an early one. We were off on a day trip to Washington DC!! Great pictures sweet, very jealous I would love yo go to New York.